Many of you have would tried to install and run turbo C++ in Windows 7 and Vista but may have failed to do so. You may have thought for a while what happened to your favourite C programming IDE(Integrated Development Environment), Which you used to run on Windows XP or 98 without trouble. The true story behind this problem is that your version of windows has just got better enough or say advanced that it doesn't support the decades old "Dos" based software. Windows after 9x(93,95,98 etc) versions are not running of top of dos, they run on a completely different Technology called NT(New Technology), so to provide compatibility with DOS software Microsoft provided these version of windows have a system called NTVDM (NT virtual dos machine), which emulates DOS like environment to run these dos programs but when Windows evolved to Windows Vista and 7 Microsoft removed some capabilities of NTVDM, because of some compatibility issues with Aero graphics and stuff. So now any dos program has no direct access to hardware neither can any dos program Go Full-screen. If you want to build this yourself then here is a DIY guide. Get the Registered Version Just for $2.99, in the registered version you will always get priority support through your registered email address. Just click below on either Paypal or Payza to Register. 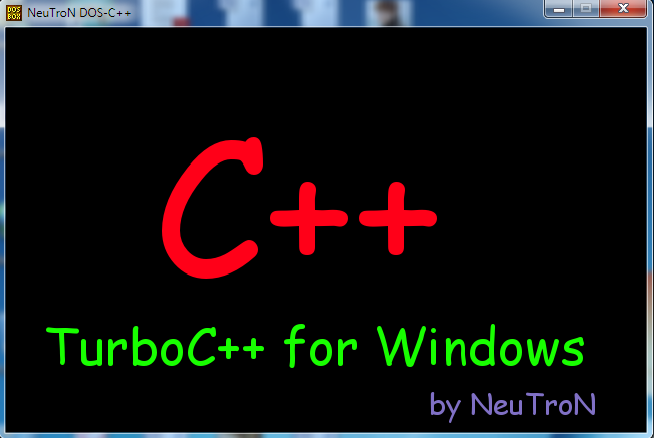 Now "TurboC++ for Windows" officially supports installation on Windows 8. Help and Support Will only be provided on supporter Versions. You can just download and install the setup and enjoy Programming with your Turbo C compiler click here to download. Google Chrome may report this as malicious but rest assured this is not so please use a different browser or Turn off the "Phishing and Malware protection" temporarily. Click to View Change Log. You Also get the NvSTECH community Toolbar with it, which will always keep you updated about the latest info about "TurboC++ for Windows 7n8". Those who are facing problems like keyboard Certain keys not detected or Numpad not working or freezing of Turbo C window Please try below provided Test versions. If you want all your drives/Partitions to mounted automatically (like some have requested this feature), this feature will provided in the next version, but for now you can download and install the patch Drive_Automounter below and avail this feature. After Downloading and installing these patches please post your results in the comments below so that other users can also benefit from your test. While posting please post your Laptop/Desktop model or Chipset type and the problem you were facing, also which patch version solved your problem. From version 3.7.8.9m_r on-wards users can select their own installation directory. But still default is "C:\TurboC++". So users can also install in D, E or F, or any other Drive of User choice. Can also be installed as Limited or Guest User. Important info while running in Windows 8: If your keyboard layout is any other than English(US) Keyboard Short-Cuts will not Work. For those who are having Problems with processing of Floating point numbers or are getting garbage values then use beta-3 or beta-4 update patch. During re-installation please un-install it properly back-up all the source code files from "C:\turboc++\disk\" folder and delete the folder "C:\turboc++", reboot your computer and then you can proceed to re-installing it. As reported by some users, if mouse hangs after running a program you can re-enable it by selecting repaint desktop option from main menu. For that first press F10 use arrow keys to goto main menu(left of FILE menu) and select Repaint Desktop. For the convenience of the users some example programs have been given. Un-installing won't delete the source files you created, you can find them in "C:\TurboC++\Disk" folder. For Graphics programming please use "C:\\Turboc3\\BGI" instead of "C:\\Tc\\BGI" as BGI path. People who have problem regarding inserting special symbols please use the key-mapper to suite your needs, it can be opened by pressing "Ctrl+alt+F1" and change the mapping according to your needs, please don't toggle it if you don't know what you are doing. Some people using this on laptops or AIO-pc (especially on HPQ laptops) face some problems like malfunction of symbols on keyboard, it is due to the multimedia enhancement driver or remote controller provided with the laptop. This issue can be resolved by un-installing those drivers. In future release those problems will be solved. Keep checking for a update in case of trouble, this has been tested on Windows 7 32 and 64 bit and works fine, and if any problem is found then please report at striker.dbz@hotmail.com, it will be resolved in future releases. Some users might be facing a problem like this, if so please download the latest version from the above link.